“Brother” Jun. Cool is as cool does. Wow. 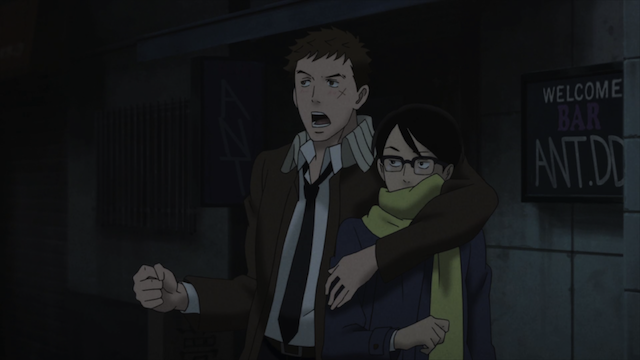 Episode 4 of Sakamichi no Apollon (Kids on the Slope) was the best yet. Just as the quartet comes together musically, the romantic relationships between Kaoru and Ritsuko and Santarou and Yurika seem to be falling apart. An impulsive act leads Kaoru to realize he really has no chance with Ri’ko, and, motivated by jealousy, Kaoru acts like a jerk to Sentarou. 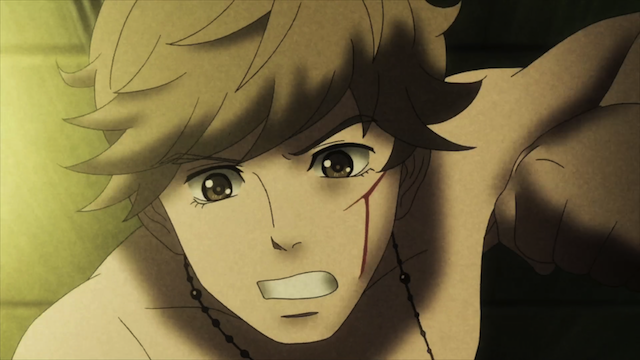 Sen rises far above Kaoru’s pettiness, and reveals his own tragic past. This whole section was excellent, from Kaoru’s foolish advance to his realization that he had conveniently (and very unfairly) misjudged Sen. In the end, Kaoru is able to see Sentarou for who he is, and in doing so he realizes why Ritsuko is in love with him, and that his own love for Ri’ko is petty in comparison to her feelings for Sen. Appearing LIVE, the Mukae Tsutomu Quartet. 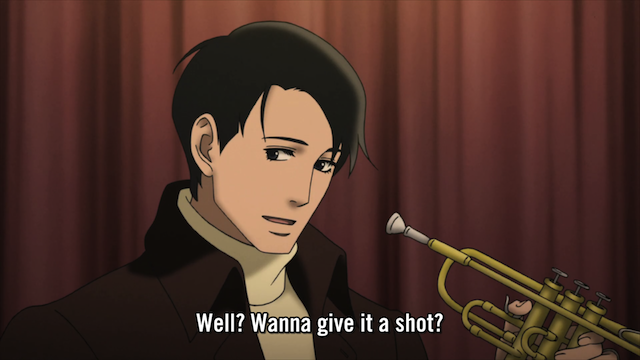 The boys get to play Jazz live at a bar, but things go horribly wrong, when a drunken bigot stops them. Brother Jun smooths things over a bit with some crooning, and in the process gains a new fan. Unfortunately for Sentarou, the new fan is Yurika. It looks like we now have a love pentangle. I didn’t realize this series was going to move in this direction, but it has done so in a very natural fashion. It is a real shame for Sentarou, however, because I thought Yurika, who seems to be a bit of a free spirit, was a good match for him. 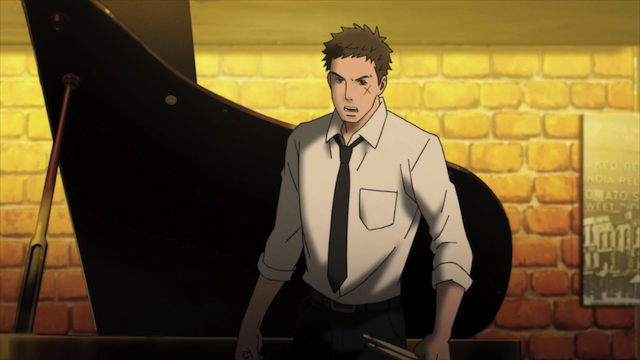 They may be “Jazz nakama”, but Jazz doesn’t seem to have the power to bring about a happy ending for Kaoru or for Sentarou. 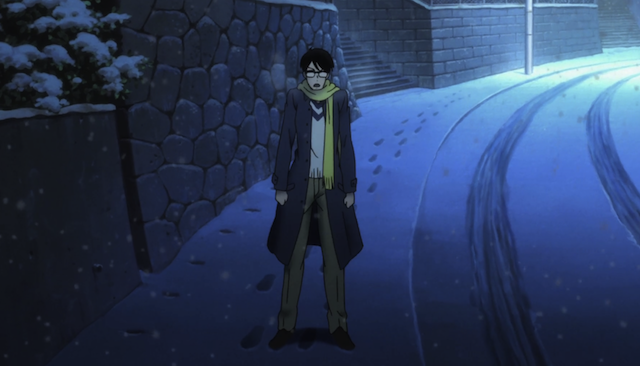 Sentarou (left) and Kaoru (right). 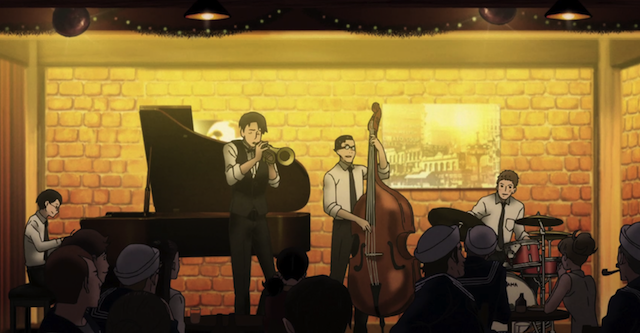 Jazz nakama. Right at the moment I think things go wrong for everybody. It is still very early but this set up sure looked like everybody will end up broken-hearted in the end. Hmm… This anime looks very interesting. Sort of like Beethoven Virus. I haven’t seen Beethoven Virus, so I don’t know if the story is similar, but Sakamichi no Apollon has been quite interesting so far.